Design you own custom jewelry Boston with precious metals, colored gemstones, & diamonds are masterfully crafted together by our in-house goldsmiths. Your desire. Your vision. Your dream piece of jewelry. We add pen & paper and, through the art of rendering, your design begins to become a reality. Precious metals, colored gemstones, & diamonds are masterfully crafted together by our in-house goldsmiths. Your ideas are transformed into a work of art. A work of art you can wear. A work of art you can enjoy & admire. A work of art you will love. A work of art that’s all yours. 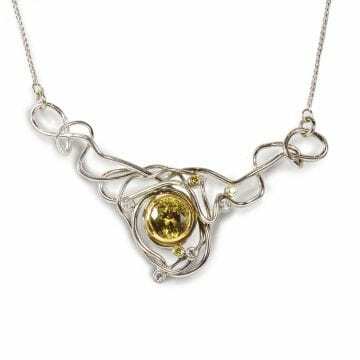 Whether you want to start from scratch or are looking to make over an existing piece of jewelry, the design process at Richter’s is fun & exciting. And, it’s all about you. 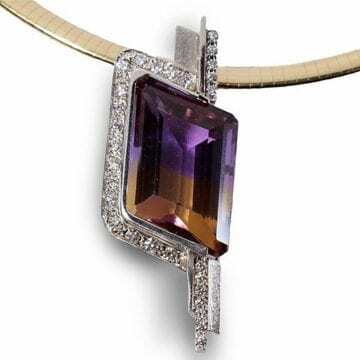 The 14kt white gold ametrine & diamond pendant features (1) rhomboid cut ametrine accented by (28) round brilliant bead set diamonds that have a carat weight of 0.88ctw. The custom sterling silver bangle bracelet features (1) triangular cut ammolite bezel set into a contemporary twist design. The 14kt white gold custom ring features (1) pear shape Santa Maria aquamarine that has a carat weight of 1.86ct. Designed & fabricated by Paul Richter. 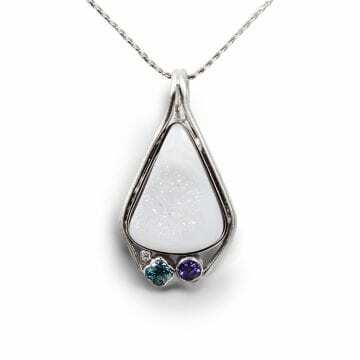 A modern take on the traditional family birthstone pendant. 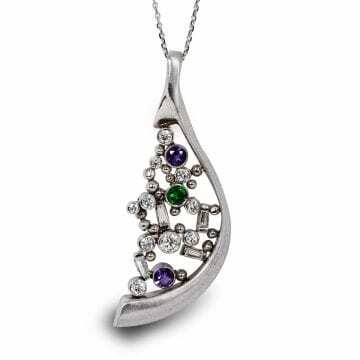 The custom pendant features a combination of tsavorite garnet, amethyst & diamond set into a contemporary design. 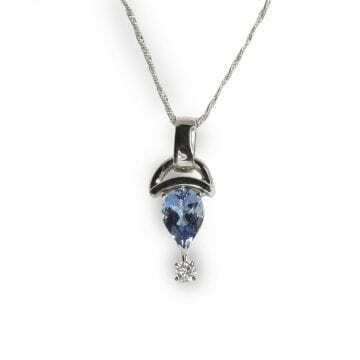 The custom designed blue zircon and diamond features one 10mm blue zircon that has a carat weight of 5.67ct. 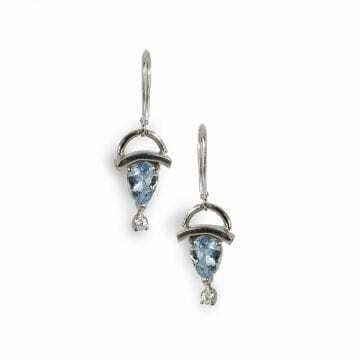 The zircon is surrounded by a halo of white diamonds and accented by blue diamonds. 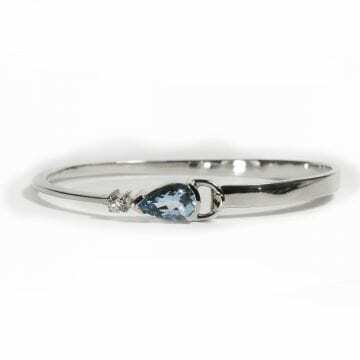 Ladies 14kt white gold custom blue zircon & diamond ring. 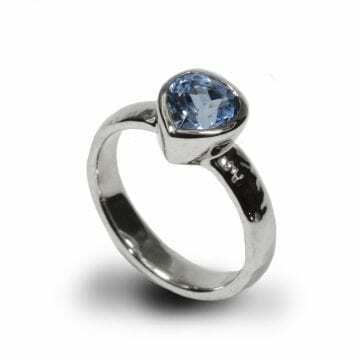 The ring is a double halo design that features (1) round brilliant cut blue zircon that has a carat weight of 5.67ct. 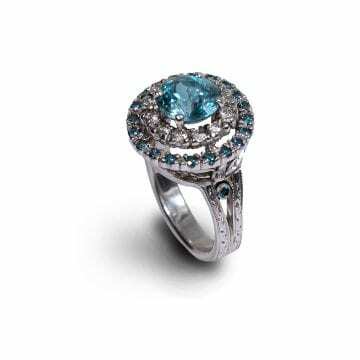 The blue zircon is surrounded by round brilliant cut white diamonds and round brilliant cut blue diamonds. 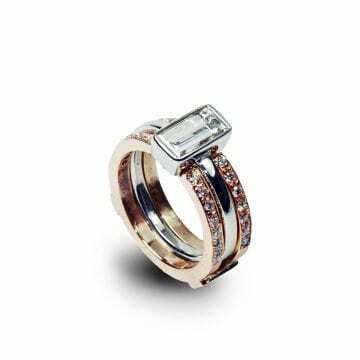 One blue diamond is bezel set on each side of the ring. The white diamonds have a carat weight of 0.72ctw. The blue diamonds have a carat weight of 0.74ctw. 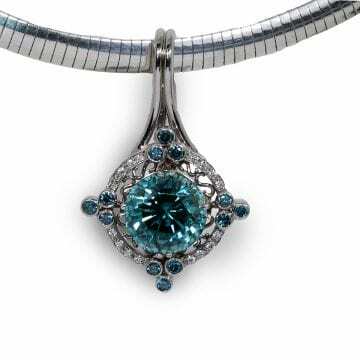 The 14kt two-tone pendant features (1) bezel set oval blue zircon (3.69ct.) accented by (3) blue diamonds (0.32ctw,) (2) green diamonds, (0.05ctw,) (2) white diamonds (0.48ctw) and (1) mint green tourmaline (0.15ct.) 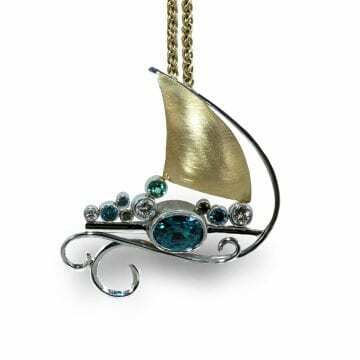 The sail of the pendant is finished with 18kt yellow gold. 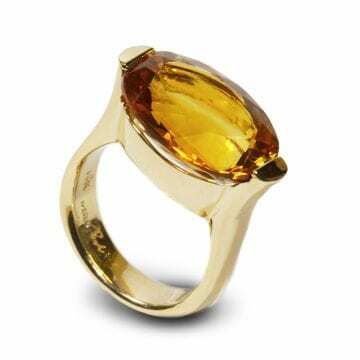 The 14kt yellow gold ring features (1) east/west oriented, bar set oval citrine. 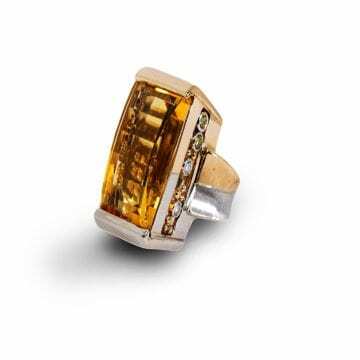 The citrine has a carat weight of 15.15ct. 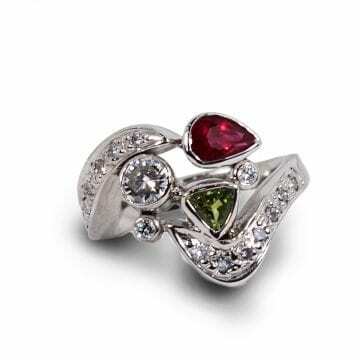 Custom 14kt white gold birthstone ring featuring a beautiful combination of ruby, peridot and diamond. 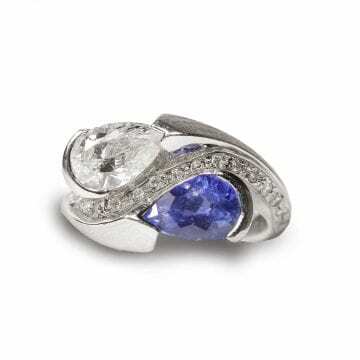 Keep the ones you love close with a custom birthstone ring from the River Collection. 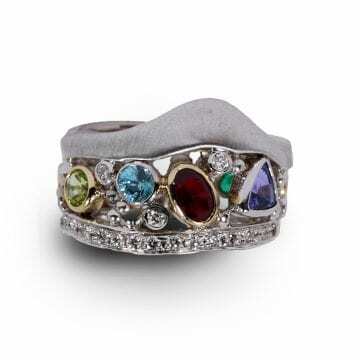 This custom family ring designed & fabricated by Paul Richter features a beautiful combination of alexandrite, emerald, peridot, blue zircon & plum sapphire. Create your own combination today! An original wedding ring restyled for a new stage in life. 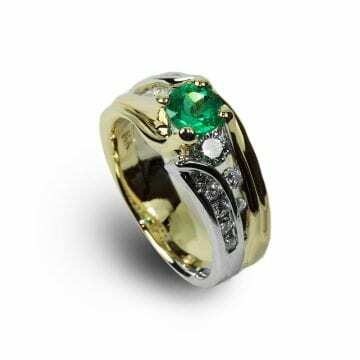 The customer's diamonds were reset into the ring and accented by the addition of alexandrites. Designed & fabricated by Paul Richter. 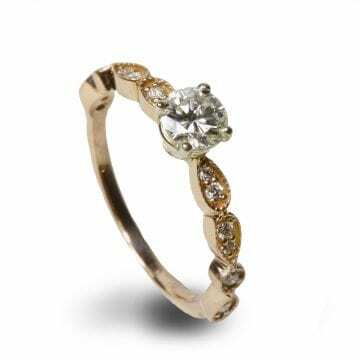 Heirloom diamonds inspired the design of this custom ring. 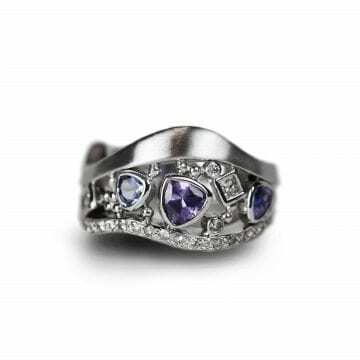 Purple sapphires completed the look and made the ring ready for the next generation. Designed & fabricated by Paul Richter. A customer's heirloom diamond takes on new life for the next generation in this custom designed ring. 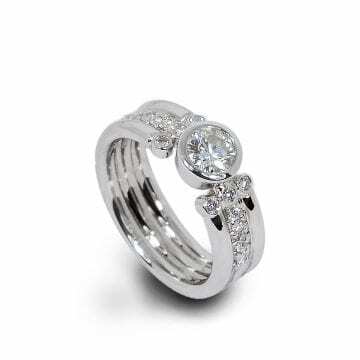 This custom diamond band was a very sentimental project for one of our customers. She wanted to create a new ring using the diamonds she received from her mother. The result was a ring that not only held its sentimental value but also reflected her own personal style. 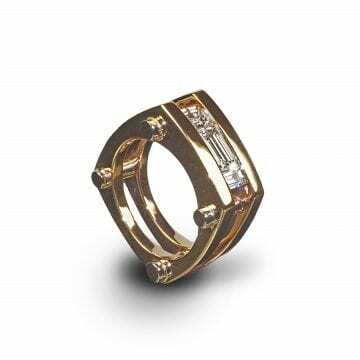 The 14kt white & rose gold diamond band was created from a client's diamonds that we removed from jewelry she was no longer wearing. The band was designed & fabricated by Paul Richter. Time for a makeover? Thinking about resetting your diamond? 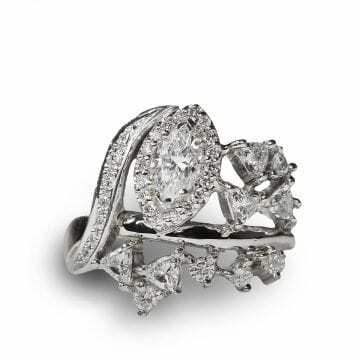 The customer used her original diamond as the focal point for this beautiful custom platinum diamond engagement ring. Designed & fabricated by Paul Richter. Vintage flair was key in the creation of this custom designed engagement ring that features a gorgeous mine cut diamond. 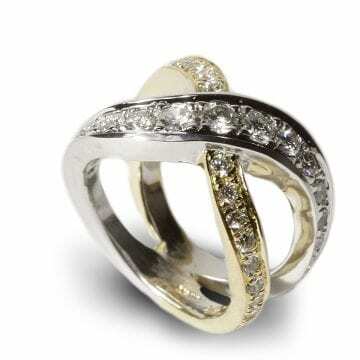 The 14kt two tone ring features (31) round brilliant cut diamonds that have a carat weight of 1.65ctw. Looking for the perfect mate for your engagement ring? Custom design may be your answer. This diamond wedding band was designed to be the just the right fit for the engagement ring. Wedding set makeover! 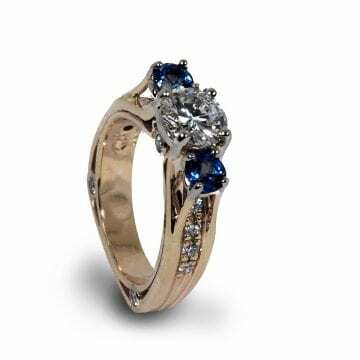 Our customer wanted to redesign her engagement ring & wedding band. 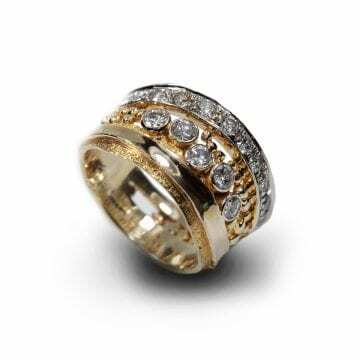 The result is a whole new look combined with the ease of one ring. 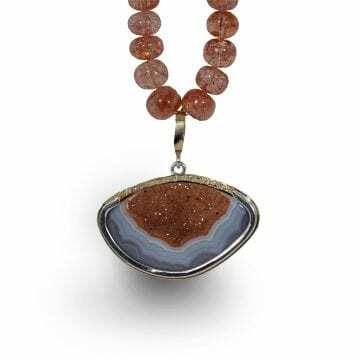 The custom 18kt yellow gold & sterling silver necklace features (1) bezel set freeform orange druzy quartz carving that hangs on a sunstone bead strand. 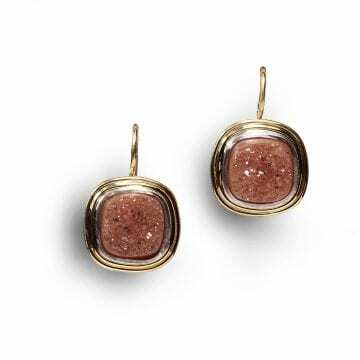 The custom 18kt yellow gold and sterling silver earrings feature a matched pair of orange druzy quartz. Designed & fabricated by Paul Richter. 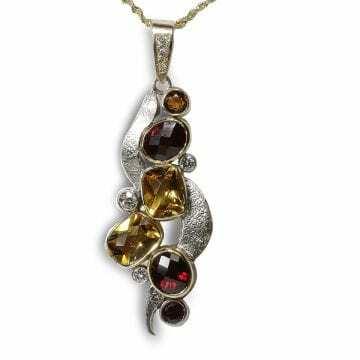 The 18kt yellow gold & 14kt white gold multistone pendant features a combination of garnet, citrine & diamond. 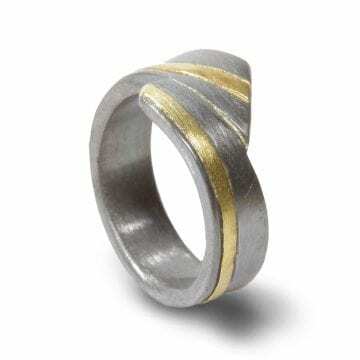 The custom Pathways band is a combination of oxidized sterling silver and 18kt yellow gold. 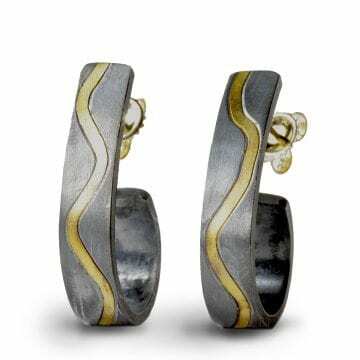 The custom Pathways earrings are a J hoop style that feature a combination of oxidized sterling silver & 18kt yellow gold. Designed & fabricated by Paul Richter. 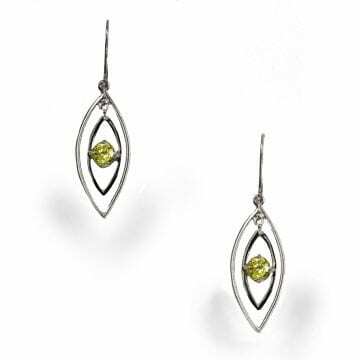 Custom oxidized sterling silver & white gold peridot and colored diamond ring from the Pathways Collection. 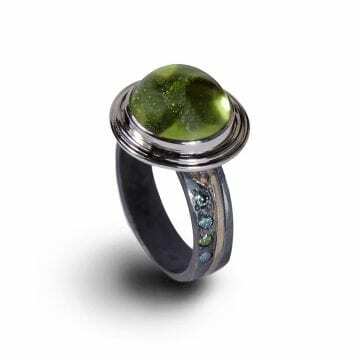 The ring features a center cabochon cut peridot (10.10ct) accented by round brilliant cut blue & green diamonds. 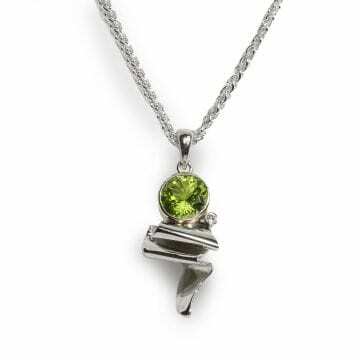 The 14kt white gold pendant features (1) round brilliant cut 8mm peridot (2.06ct.) 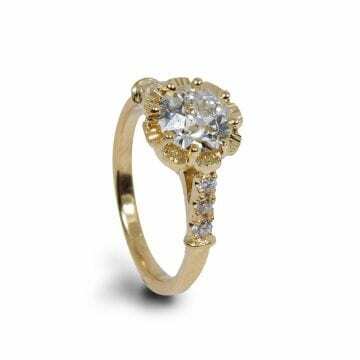 accented by (1) round brilliant cut diamond (0.03ct.) Chain sold separately. Love a bold color combination? Check out the amazing color contrast in this ring. 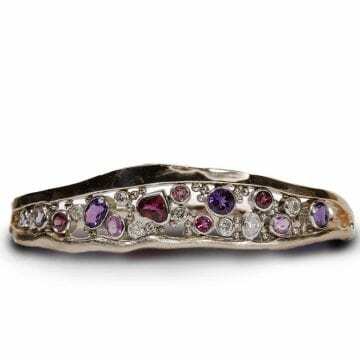 The custom ring features a rare purple garnet accented by blue & white diamonds. Designed & fabricated by Paul Richter. 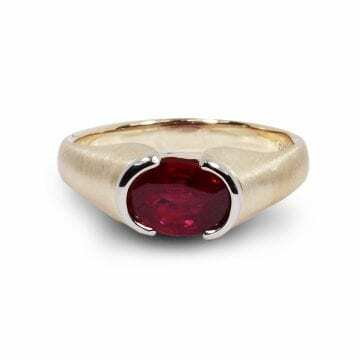 Ladies 14kt two-tone gold ruby ring. 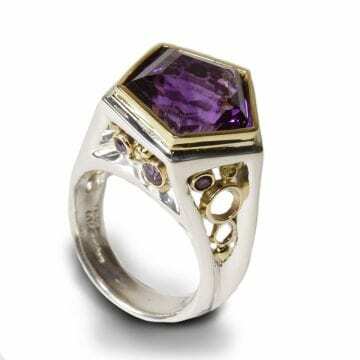 The custom designed & fabricated ring was features (1) semi-bezel set ruby center stone that is positioned east/west. 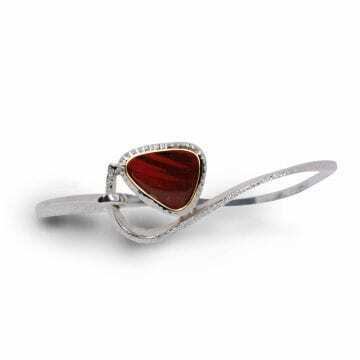 The ruby is a vivid pigeon's blood red hue with high color saturation, medium dark tone and SI clarity (type II). The ruby has a carat weight of 2.15ct. 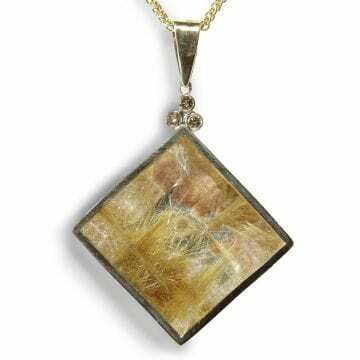 The 18kt yellow gold & sterling silver pendant features (1) square cut rutilated quartz (42.52ct) accented by (3) round brilliant cut brown diamonds (0.11ctw.) Chain sold separately. 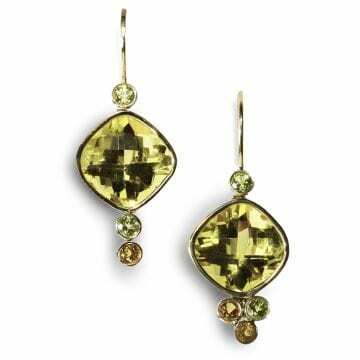 Ladies 14kt yellow gold custom designed & fabricated smoky quartz earrings. 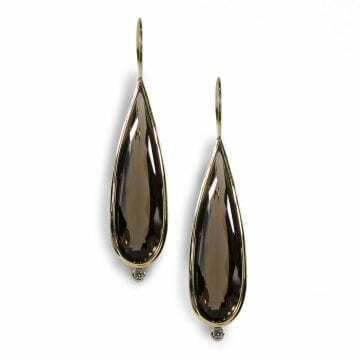 The earrings are a bezel set style that feature a pair of elongated pear shape smoky quartz. The quartz have a carat weight of 32.30ctw. Ladies 14kt yellow gold custom designed & fabricated smoky quartz pendant. 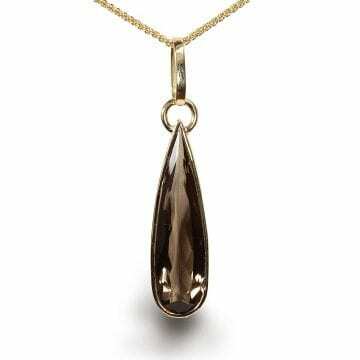 The pendant is a bezel set style that features (1) elongated pear shape smoky quartz. The quartz has a carat weight of 16.75ct. Chain sold separately. What connects you as a couple? 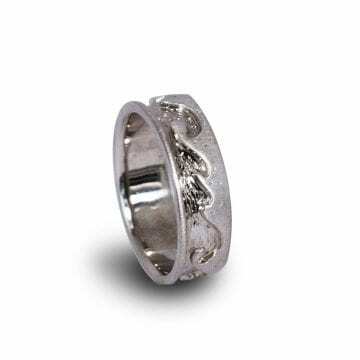 Show it off on your wedding band! Custom wave ring designed & fabricated by Paul Richter.